Nathan SooHoo is guest on this episode of DC Entrepreneur. Nathan served as Business Development Manager for Trulioo where he helped build partnerships and worked on strategic sales for the company's GlobalGateway product before moving to Facebook. Nathan is also an investment committee member for the UCLA VC Fund whose portfolio includes Cloudera, DogVacay, Twitter, SolarCity, SmartestK12, RivalMe, Kythera Biopharmaceuticals, and Vicept Therapeutics. He is also formerly the lead analyst for Venture Scanner, a startup market reporting and data research firm. Chimamanda Ngozi Adichie TED Talk "The Danger of a Single Story." Meet entrepreneur Jonathan Wossene who shares his story about creating Melted Element candles, a premium retail business he started from his apartment in Alexandria, Virginia. Melted Element candles are destination-inspired, soy-based candles which burn clean, something that differentiates them from the rest of the marketplace. Jonathan tells the story of how his cat inspired the business and helped launch him on a new trajectory to create the premium candles, which have appeared at the West Elm pop-up at Union Market, the Ritz Carlton and featured on CNN. He also shares stories about his love of music and flight, and a previous startup he worked on in the aerospace industry. Dr. Gerald Gordon, President and CEO of the Fairfax County Economic Development Authority is guest on this episode of DC Entrepreneur. He discusses the resources available for business startups in Fairfax County, which is home to some of the largest private sector employers in the region. Fairfax has the highest density of startups in NoVa according to Fosterly's 2016 census, and is also home to many large IT and government contracting businesses. George speaks to Jay Kim, Chief Strategy Officer of Upskill. We talk about the Skylight platform for smart glasses, the internet of things, and how Augmented Reality will take over the world as part of Industry 4.0. This episode of DC Entrepreneur Radio features Brett and Alex who started Grape Intentions, a wine club that helps do good by giving a percent of their online purchases to select charities. Brett who had training as a sommelier and Alex had run a rowing repair shop, a sport the two friends have in common. They talk about how they developed the startup, the issues and challenge behind shipping a product like wine, and how they developed a 'palate picker' algorithm to help customers confused by foreign wine labels discover the ideal wines for them. George speaks with Sam Sabin, tech reporter with DC Inno, a local blog that covers what's happening in the technology startup scene in Washington, DC. In this episode, we review some of the big tech headlines of 2017 and speak about what's in store for the future of the region. George speaks with Isaac Oates, founder of Justworks, via remote conversation in this episode of DC Entrepreneur. The company raised $33 million dollars after their last Series C round for a total of $53 million over the past five years. Isaac talks about his career path from being in the U.S. Army reserve, to selling his company Adtuitive to Etsy. He also speaks about Justworks' value proposition, the tech behind the scenes that runs the company, and the unique regulatory challenges of working on a company that focuses on HR. This episode also features special guest to the studio Charlotte the dog, who unexpectedly makes her first appearance as co-host of the show. Listen to my conversation with Lance Kramer about starting Meridian Hill Pictures, a production company he founded with his brother Brandon, both of whom created the documentary, "City of Trees" (now on Netflix). Podcaster Jennifer Crawford is guest on this episode of DC Entrepreneur. We discuss the upcoming DC Podfest on November 10-11, and why she thought DC needed to have its own conference focusing on podcasters. Jennifer discusses the challenges creative entrepreneurs face, and why it's even tougher for creative class to get recognized for their talent. She also talks about her work helping people with their social media campaigns, her work for Podbean, and her improv troupe: the Improv Imps, and how she's been balancing this with her podcast the Jelly Vision show! Nicole Gallub is guest today on DC Entrepreneur. We talk about her transformation from cybersecurity analyst into pink-haired DJ Neekola and founder of Pelonkey, an artist management agency that works with performers, DJs, performers, fire spinners, photo booth vendors, graffiti artists and more. You'll also get to listen to her DJ mix at the end of the broadcast. This episode features Alex Villanueva, founder and CEO of Sprynt, a shuttle service for North Arlington. Sprynt differentiates itself from other ride share services with free rides. Their business model derives from selling advertising to local businesses to get the word out. Alex also talks about his switch from being a CPA to becoming an entrepreneur. Amelia Friedman is our guest on this episode of DC Entrepreneur. She is the co-founder of Hatch, a Y Combinator-funded app and software development startup. Amelia also helped establish the Vinetta Project's DC chapter which helps women entrepreneurs around the region. Her first startup was a non-profit called the Student Language Exchange when she was a student at Brown University. Amelia talks about her experience as a startup founder, her work in the DC tech scene, and how she and her partner helped bootstrap their startup idea by creating a card game to raise capital. In this episode, George speaks with Sarah Van Dell, CEO of Plum Relish, a District startup that offers lunch catering for office workers and events. Sarah speaks about her path as a startup founder, and how the idea began while she was working for the Advisory Board Company. She also talks about her all-women advisory board, her business partnerships, and why "Food Tech" is the next big thing. George talks with social entrepreneurship founder Kate Glantz who built Heartful.ly Registry, a wedding registry website where couples can raise money to help charities and non-profits. Kate, a Tory Burch Foundation fellow is director of DC Entrepreneur Initiatives at SEED SPOT and involved with Halcyon Incubator, and Vinetta Project. Kate speaks about her journey from serving in the Peace Corps in Tanzania to becoming an entrepreneur, navigating the DC Tech scene, and her take on failure vs success as a startup founder. Today's DC Entrepreneur features a conversation with Pierre Malko, President and CEO of Ouli, a mobile concierge app that serves the local DC area. Ouli helps connect people with local merchants that have great offers for people looking for a place to eat, go out with friends, and celebrate life’s occasions. The business model lets merchants pay for only when customers have come through the app. On today's episode of DC Entrepreneur, Grant Elliott, Founder and CEO of Ostendio speaks with George. The word Ostendio in Latin means to show or demonstrate, and Grant helps illustrate his journey from working in the corporate world to founding a Cyber Security & Information Management company. He talks about his work as a Mentor and Instructor to startups and his own unique journey as an entrepreneur. Hal Shelton, board member of SCORE Association, and angel investor with Blu Venture Investors, LLC is today's guest on D.C. Entrepreneur. 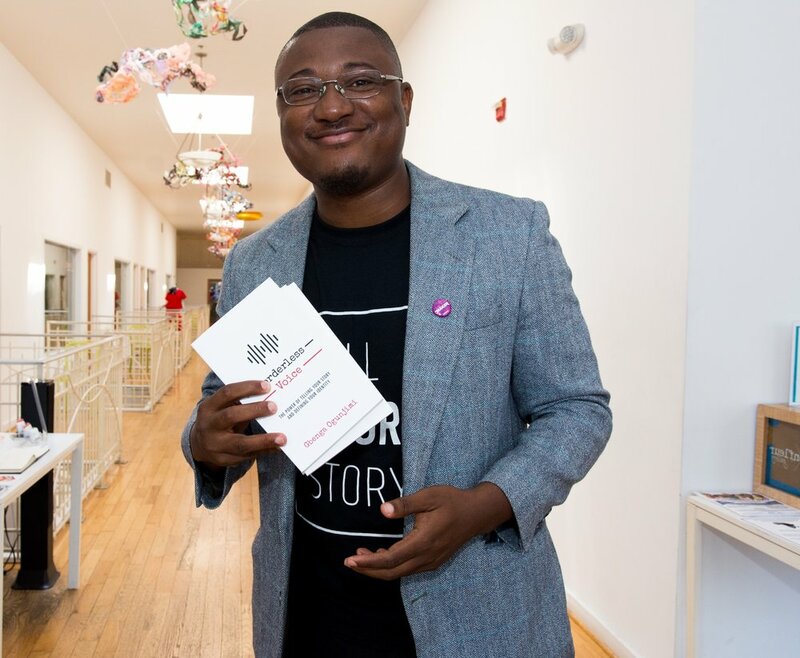 Shelton, the author of "The Secrets of Writing Successful Business Plans," shares his advice to entrepreneurs starting to map out their business. George speaks with Daniel Turissini, owner of Recharj--a modern meditation and power nap studio in Washington, DC. Daniel left a career in cybersecurity to focus on creating health and wellness options for District residents. We talk about mindfulness, meditation, and how proper sleep are essential tools for today's entrepreneurs. On this show, George speaks with Dionna Dorsey, a Creative Director from Springfield, Virginia. She is the founder of District of Clothing, and head of Dionna Dorsey Design, a creative design boutique that specializes in graphic design, art direction, brand strategy, and website development. Dionna is also a featured creative as part of 202 Creates, an initiative of D.C.'s Office of Cable Television, Film, Music and Entertainment. George speaks with Brandon Luong, Product Manager for WeTogether and the brains behind DMV Startup. Brandon was also a co-organizer for the DC Tech Meetup. Brandon speaks about his love for DC Tech, diversity in the tech startup community, and his growing up around entrepreneurs as a "restaurant baby." In this conversation, George speaks with Michael Sabat, founder of @Mssg which helps marketers increase conversions and decrease Cost Per Acquisitions (CPAs). An organization can connect @Mssg to an existing Facebook Ad Campaign or other page, measure the results, and compare the results to their other touchpoints. © 2019 DC Entrepreneur, all rights reserved.